Tower Hamlets, No Place For Hate, Hate Crime Champions Project. 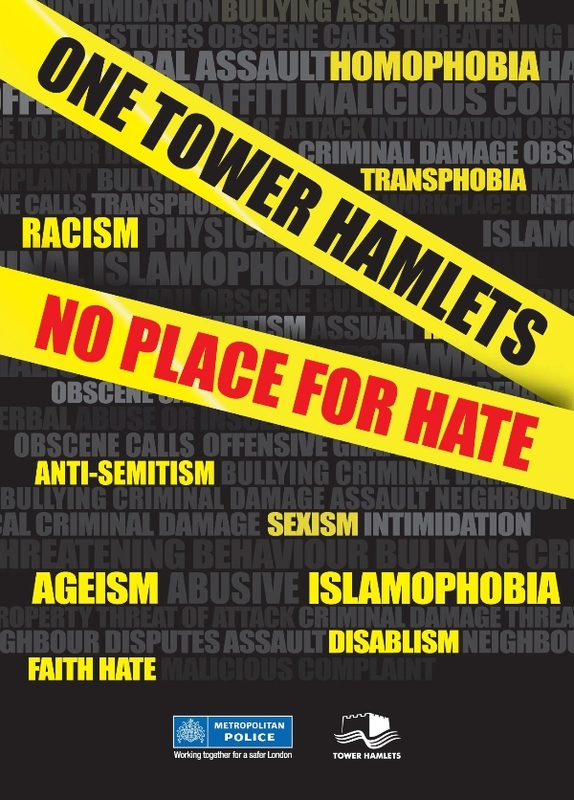 The London Borough of Tower Hamlets (LBTH) created the Hate Crime Champions Project in 2008 to share and promote its vision of a safe and cohesive borough free from all forms of hate. LBTH is one of the most diverse boroughs in the country, with a large number of residents from minority ethnic communities, the largest Muslim population in England and one of the largest youth populations in Europe. This project is delivered by volunteer champions that represent a cross section of the community supported by the borough’s Hate Crime Team and governed by the hate crime strategic group the ‘Tower Hamlets No Place for Hate Forum’ (THNPFHF) which brings together key agencies including Tower Hamlets Council, Metropolitan Police, Housing Providers, Schools,Tower Hamlets CCG, Public Health, Legal Services, Victim Support,Faith Organisations, local voluntary sector groups and the local LGBT plus Forum and has high level political support. What has made us particularly proud is that through this project we have successfully reached marginalised groups such as Refugees/Newcomers,LGBT community, Faith Groups, Disability Groups, Young People, Faith& Non Faith Groups, Women’s Groups. Since the launch of the project, LBTH has recruited 128 champions who have delivered over 1086 training and public engagement activities, reaching in excess of 65,000 people including very hard-to-reach groups who can be reluctant to report, for example disabled residents, former rough sleepers, deaf Asian women, refugees, newcomer communities, non-English speaking groups, substance misusers, LGBT and elderly communities. In total champions have encouraged 150 organisations and 3000 people to sign the ‘No place for Hate’ pledge including local residents Dame Helen Mirren and Sir Ian McKellen. In the near future, I will beoffering workshops to educate people on hate crime and raisingawareness through incorporating it into current newsletters and information displays at my local GP Surgery"
"One of the reasons I wanted to become a NP4HC champion was because I experienced discrimination as a child and young adult. I did not have the skills or confidence to challenge this at the time and want to help empower others so they can feel confident to address hate crime and know where and how to report it… I work in a housing association with a rich diversity of residents and want to help raise awareness of staff and residents so together we can tackle Hate Crime and work towards a more cohesive community"
HEAR Equality and Human Rights Network is a network of voluntary and community sector organisations across London working for equality, rights and social justice and against discrimination. We are currently funded by City Bridge Trust and Trust for London. 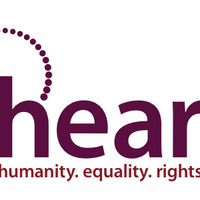 Under the Bridge funding we work to ensure that specialist equality and human rights groups, particularly the smaller and user led ones, are included in the development of the Way Ahead. This also funds our core activities as a network of regular bulletins and information provision, knowledge sharing, signposting, website and networking. The Trust for London project funds our Policy and Campaigns work, which supports organisations to campaign together on equality and rights issues of joint importance. Currently campaigns are focused around support for deaf and disabled refugees and asylum seekers, hate crime, mental health equality, LGBTQI+ diversity and digital exclusion. We also sit on the National Asylum Stakeholder Forum Equality Sub-Group who work alongside the Home Office to ensure the rights of asylum seekers are protected.